Last month I thought I was being as busy as humanly possible, but life proved me wrong — this month I’m even more busy. So, I’m just posting this quick last minute note about this month’s donations. The open source project that I’m supporting this month is Tracks, the Getting Things Done web application built in Ruby on Rails. I have been using it for more than two years now (I already made a donation to the project back in July 2012) and I highly value its simplicity and usefulness. My second donation goes to the “Sfora” Foundation in Warsaw, dedicated to helping stray and mistreated dogs. This is the third time that I’m supporting them, and the two previous donations were also made in September, so I guess I can now officialy consider “Sfora” a regular donation recipient for the month of September. Having way too much work? Check. Making the monthly donations at the last moment before the end of the month? Check. So everything is in order, let’s get to it. Today I’m making a donation to the LibreOffice project, and this is the second time that I’m supporting them — the first time was in December 2012. LibreOffice continues to be one of the most important software packages that I use almost every day, thanks to the joys of running a small business and thus constantly having to deal with text documents and spreadsheets. Although I would very much prefer not having to do that and just play with source code, that’s how it is, and at least LibreOffice makes it bearable. Thank you once again, the Document Foundation! The second of this month’s donations goes to the Animal Shelter in Olsztyn, also not a first-timer, since I already supported them in April, and in February last year. To the staff and volunteers of the Shelter — all the best and keep up the good work! As the glorious tradition goes, Iâm doing another round of monthly donations supporting open source projects and charity organizations, and per a slightly less glorious tradition, Iâm doing this on the lastest day of the month. This monthâs open source project that Iâm supporting is one small utility that is so common that I found it hard to even think of it as a project of its own, it seems like an elemental component of every operating system that Iâm using these days. 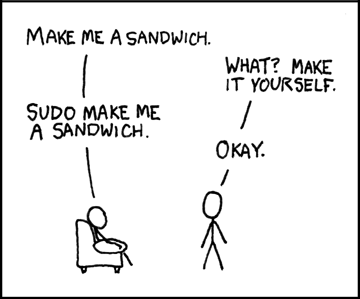 And if youâre reading this on Linux or Mac OS X, itâs pretty likely that you use it all the time as well, because Iâm talking about Sudo, the program that gives you great power whenever you need it. Sudo is mostly used to gain root privileges, but it can do much more than just that — itâs highly configurable and gives you fine-grained control over whoâs allowed to run which commands. Iâm also supporting the Animal Shelter in Olsztyn (for the second time, since I also sent them a donation last year). My blog is temporarily in sleep mode with just the donation announcements coming up every month — I’m sorry about that, but I’m swamped with work and have zero time for writing posts or for my personal projects. Hopefully, in March things will slow down a bit and I’ll have some time to get back to that. Anyway, it is the time for this month’s donations. The first organization that I’m donating to is the OpenBSD Foundation, and it’s yet another long-deserved donation, as I’m an everyday user of the two main products that are supported by the Foundation — OpenBSD and OpenSSH. An OpenBSD machine acts as a gateway in my home network, and pretty much every machine that I use is running OpenSSH. So, guys, thanks for being with me all the time and keeping my network activities secure! I’m also sending a donation to the “Little Claw” Foundation (not to be confused with “Cat’s Claw” that I supported last month), which helps stray cats by neutering them and finding them new homes. Some time ago I had the pleasure of speaking with the Foundation’s director, and I know the people behind it are truly dedicated to their cause. I wish them all the best in their efforts. Once again I’m doing the monthly donations on the very last day of the month. I wonder if there’s a badge for a master procrastinator… Alright, let’s get down to business. The open source project that I’m donating to this month is Transmission, the popular BitTorrent client, initially released back in 2005. Highly renowned for its stability and low resource usage, it’s currently the default BitTorrent client on a number of Linux distributions. I happily use it both on a Linux desktop and on a MacBook. The second of this month’s donations is to the “Cat’s Claw” Foundation in Poznan, formed in 2006, which is committed to providing help to stray animals — mostly cats, as the name suggests. It’s the second time that I’m supporting the Foundation, the first time was a year ago. All the best to the “Cat’s Claw” crew of volunteers, and to the cats under their care!